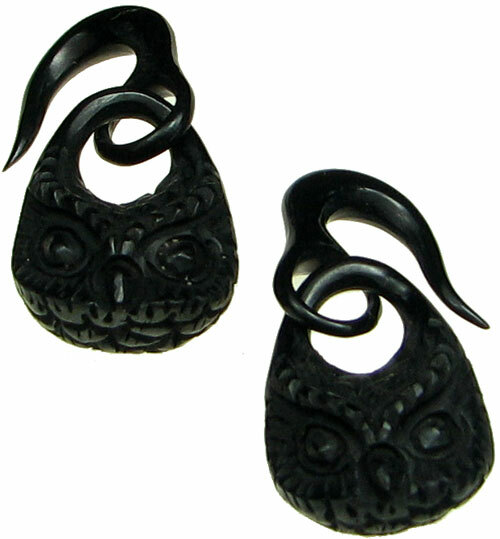 These hand carved dark water buffalo horn owl heads dangle freely from an interlocked curved horn hook. One pair of 0 gauge with minor quality issue at a great discount! On one of the hooks, the cut line where the owl head was inserted has separated a little bit, but not enough that the owl head would fall out. One pair of 00 gauge with quality issue at a great discount! One of the owl heads is hanging backwards. See drop down menu below. 10 gauge 8 gauge 6 gauge 2 gauge 0 gauge 1/2 inch 5/8 inch Select your gauge size and click "Add to Cart".